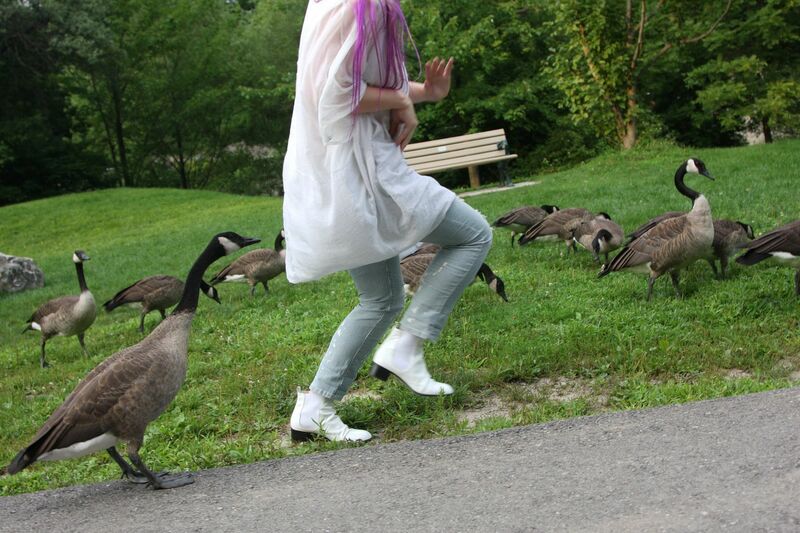 Fun Fact: We had sooo much fun with the Canadian Geese! There were so many of them! And they all gathered together to go for a bath down by the river. When they came out of the water, they had their dinner which was grass. We felt like we were part of their picnic. We couldn't stop saying how cute they were until one ran after me and tried to bite me! (The last picture is of the Canadian Goose running after me! Oh boy! Hahaha!) Pin It Now! Love it! Like your blog very much. Hope you will become a follower of my blog too? Fantastic! I love the second photo. You could do a really awesome night series continuing with this theme & using flash photography, bright colours & movement. Just awesome! (love your hair btw). Wowsers great pics!!! Love shot 2 and the shot with your super fab bag! The hair and bag matching are awesome. Love it! HAAA!!! Great shots. Yeah, those geese can pretty territorial! These pictures are awesome! I love that last pic... so funny! thank you soooo much for your lovely comment! i am flattered! Wow, I kind of really like how the hair matches the bag!! It's not the first thing that comes to mind when you're looking to match somethign with something in your outfit and this makes it so cool! Fabulous Etro Bag. These photos are fantastic! Awesome pics! I love your boots! Yay for Canadian style bloggers! oh!!! i want violet hair tooo...you look FAB!!! That bag is superb + the hair. I just found you guys, by complete fluke I might add, on the UK H&M website. How cool?! Love the second photo :D like your bag too! i love how the bag matches your hair! Haha, I love this. You look like you're having the most amazing time! Great hair, it's so cool!! i like your outfit.. it looks so great!! Oh made me laugh you running with the geese..CUTE.. You look great and love the hair!! Canadian geese! I love how your hair matches your bag! That's awesome and Toronto's awesome, too! Hehe love the last picture! and i love the boots, it needs to be on my shoe shelf :] And amazing hair! oh! tu blog es maravilloso! tienes unos outfits geniales! Lovin the blog sisterhood is always great to see!!! woooah your skirt matches your bag! great bag and fantastic ripped jeans! Thanks for visiting my blog! Your blog features such unique style :) Hope you'll come back soon! omg your hair is FIERCE! 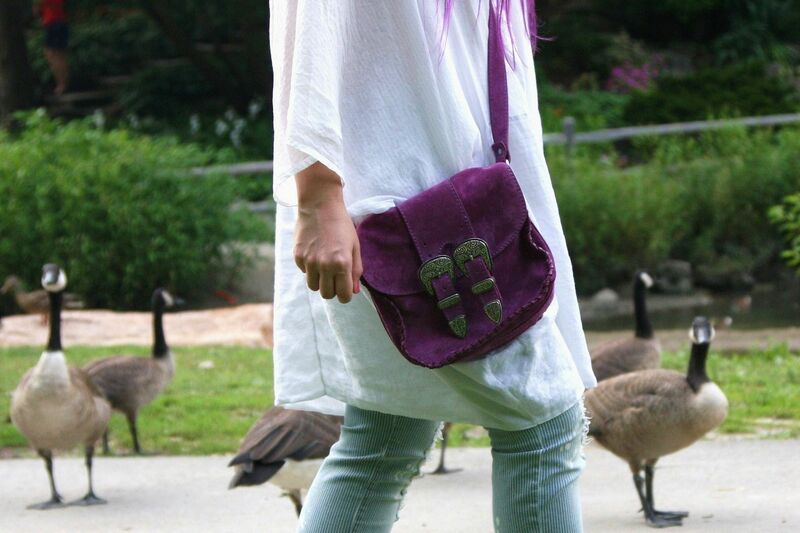 LOVE this look...and the geese! wow the color of your hair is so unique..
ha! you guys crack me up... great photos!